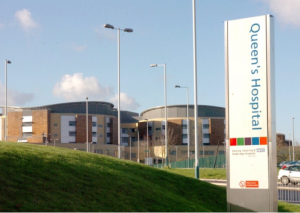 Queens and King George Hospital are the main hospitals in Barking ,Havering and Redbridge NHS Trust. They cover a local population of over 750,000 serving a diverse population in Greater North East London. They have one of the largest obstetric units in the country and deliver specialist neurosurgical services from Greater London to East Of England, reaching approximately 2 million people. The Obstetric unit is one of the largest maternity units in the countries and includes 2 obstetric theatres. In 2016-17 the unit managed approx 8000 deliveries and 2000 Caesarian sections. The Intensive Care unit is divided into Neurointensive Care (12 beds) , General Intensive Care (22 beds) and Sky HDU (10 beds) totalling 44 level 2 and level 3 beds. As well as emergency services it specialises in Urology and Orthopaedics services with an 8 bed General Intensive Care unit. Address Queens Hospital, Rom Valley Way, Romford, Essex. Last updated 3rd Oct 2018.